Preserved the handprints of your child can be a fun keepsake. This guide is about displaying children's handprints. I wanted to find a fun way to display how much our kids were growing when they were young. I made tracings of their hands when they were newborns, 1 year old, and 2 years old. I transferred the tracings onto the thin fusible interfacing (one-sided fusing). I then fused the interfacing to fabric. I cut out the handprints and used spray adhesive to attach them to paper. Then I mounted them in the frame openings. I also included a photo of both kids, mounted to colorful scrapbook paper. For our son I did a blue theme (as seen in the photo) and for our daughter I used purples. 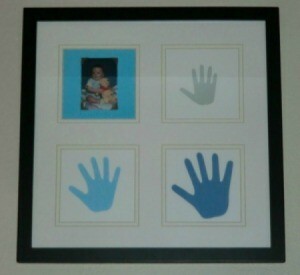 These frames have been on our walls for a few years now and I still love to see how tiny their hands used to be.